Nickel based alloys are used in those applications that require enhanced properties when compared to stainless steel. As a superior product to stainless, these alloys are reserved for the most demanding of environments from extremely high temperatures to the most corrosive of atmospheres. Avocet are proud to be UK agents for Ulbrich Stainless Steels and Special Metals Inc. Ulbrich is based in New Haven Connecticut USA and specialise in producing precision foil from stainless steels, nickel alloys and titanium alloys. Their motto “we deliver precision” says it all. They have the equipment, knowledge, imagination and technology to allow them to deliver on the most demanding specifications. 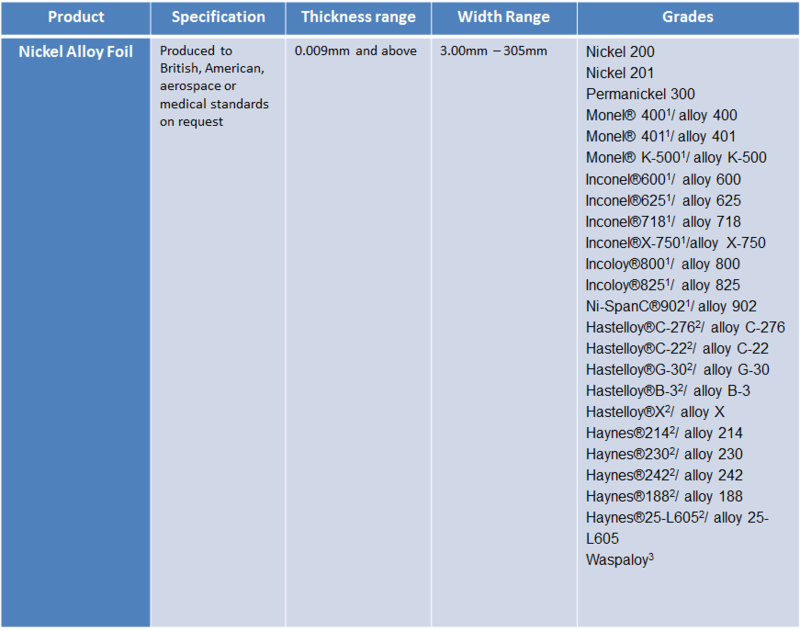 Over the past five years we have gained a highly enviable reputation for our knowledge in these areas and are now one of the leading UK suppliers of nickel based alloy foil, all produced to customer specification. Understanding our customers requirements is central to our philosophy. Holding extremely tight tolerances on thickness and surface finish to achieve a consistent and reliable product.